Recipe for Strawberries and Cream Cookies. 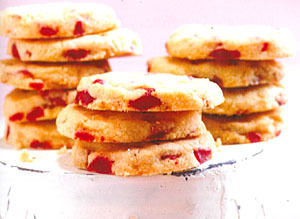 This shortbread dough is enlivened with a splash of cream along with bits of dried strawberries. Preheat oven to 325ºF. Stack two baking sheets together and line top sheet with parchment paper. In a food processor, whiz sugar to finely pulverize, about 10 seconds. In a mixer bowl, cream sugar and butter on low speed until well blended. Then add flour, vanilla, cream, and salt and blend well. When almost blended into a dough, add white chocolate and dried strawberries, mixing by hand to incorporate and make a firm dough. Knead dough gently on a lightly floured work surface about 1 minute to make dough more firm and get it to hold together. Flatten dough into a disk, wrap well, and refrigerate 30 minutes. Roll out gently about 1/2 inch thick and cut into small round cookies, about 2 inches in diameter. Place on prepared baking sheets. Place in oven and immediately reduce temperature to 300ºF. Bake until lightly browned around the edges, about 40 to 50 minutes. Cool well before removing with a metal spatula.